Located on the NE side of Tallahassee and serving as the Southeast border of Killearn Estates, the Gardens of Killearn offers executive level homes in a high demand location. The Gardens of Killearn has homes built from 1990 through the writing of this report, though most construction was complete by 2004. I have an affinity for this popular neighborhood because I helped sell many of these homes when they were new in the early and mid 1990s. 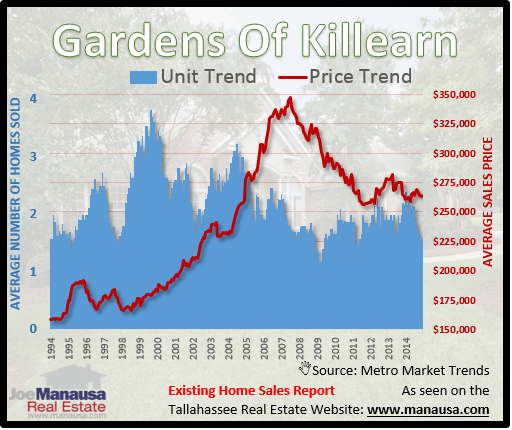 In this report, we will look at prices, values, and sizes of homes in The Gardens of Killearn, as well as show current listings in the Tallahassee MLS and all closed home sales going back to 1991. For each of the three real estate graphs found in this report, you will find the one-year average of closed home sales for each month (blue columns, measured on the left vertical axis), and an important real estate statistic shown in red (measured on the right vertical axis. It is important to note that the information in the graphs are trends, so changes seen are NOT the result of real estate seasonality, but rather a true change in market conditions. Average home prices have fallen 1% in 2014 versus 2013, but remain 19% below the peak of the market prices established in 2006. 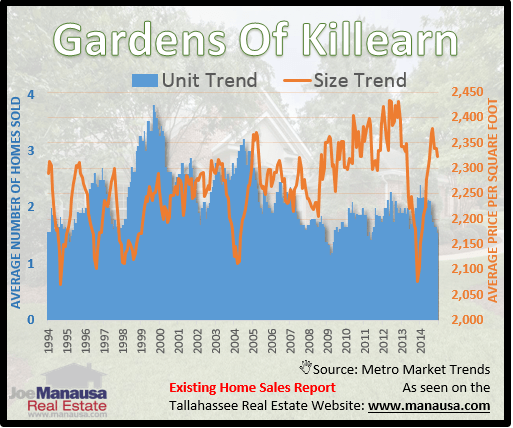 With only one distressed sale in the past two years, the Gardens of Killearn looks nothing like most neighborhoods in the Tallahassee real estate market (distressed average is 1 in 4 homes). The average recorded sales price was $262,350 for the Gardens of Killearn in 2014. Home sales activity in 2014 rose slightly over 2013, but still remains well below the peak in 1998 and the market expansion years of 2003 through 2006. There were 14 closed home sales in the Gardens of Killearn in 2014. 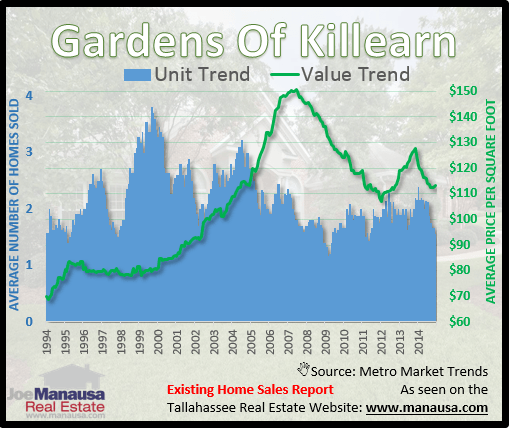 Average home values in the Gardens of Killearn declined 10% in 2014 when compared to 2013, after having posted a gain of 10% back in 2013. This type of volatility, while not expected, is likely caused by the limited number of sales (outliers and noise effect). I would expect the change in home values in the Gardens of Killearn to mirror the changes recorded in Ox Bottom Manor (which was up a few percent over the past two years). The average value of a home sold in the Gardens of Killearn in 2014 was $112 per square foot. This is up 3% over the bottom reached in 2011, but still down about 23% from the market high set back in 2006. This means that homes are appreciating again, but they are worth about a quarter less than they were in 2006. The average home size sold in the Gardens of Killearn typically falls in a range of 2,100 to 2,400 square feet, and this year buyers have been selecting homes at both ends of this range, but mostly at the larger end. The 14 resales thus far in 2014 have averaged 2,341 square feet. The following list shows home sales going back to 1991 in the Gardens of Killearn.